It’s the perfect night for trick-or-treating here: clear and mild, with a bright moon in the sky. Of course, there won’t be any trick-or-treating for me (or most people in the heart of Brighton - who goes trick-or-treating in the city?). 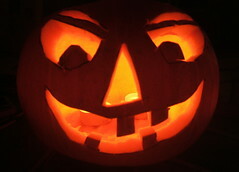 There will, however, be pumpkin soup and toasted pumpkin seeds, spooky music and scary movies on TV, and a genial yet ever so slighty sinister jack-o-latern flickering away through the evening. It may not be Halloween as I remember it, but it’s good enough.